Inflammation is very common, especially if you are dealing with an illness, disease or injury. So, what exactly is inflammation? A little bit of inflammation can be helpful to your body in response to stress. For example, if you catch a cold or flu, your body might create inflammation through a fever to help you get rid of the virus. However, chronic inflammation can lead to many different diseases, illnesses and even premature aging. Diseases and infections could include heart disease, high blood pressure, osteoporosis, arthritis, acid reflux, bacterial infections, viral infections, acne, etc. Inflammation can also just cause pain and aches. Fermented foods and liquids. Think sauerkraut, kimchi, kefir and kombucha. They are also great for your immune system and digestion. Probiotics can also be helpful. Lightly steam it to digest it well. 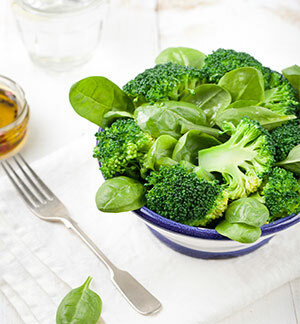 Broccoli contains a lot of vitamin C and calcium that fights inflammation. Hemp oil or any oils that contain omega-3 fatty acids. Try to only use unrefined, organic oils as well. Most adults get plenty of omega-6 fatty acids in their diet, but not enough omega-3 fatty acids. Aim to get both! Fish such as wild-caught salmon, cod or sardines. Tart cherries. Fun fact: tart cherries can reduce inflammation ten times better than aspirin! They can also help you reduce your risk of heart disease. Soaked walnuts. Soaked nuts are easier to digest. Walnuts are a great source of vitamin E and omega-3 fatty acids. Onions and garlic. They both contain an antioxidant called quercetin that helps fight inflammation. Pineapple contains an antioxidant called bromelain to fight inflammation. Spinach contains an antioxidant called carotenoids which reduces inflammation and contains vitamin E. Steam it for optimal digestion. Ginger and turmeric. Both contain curcumin which reduces inflammation. Do you think you have inflammation? Did you know all of these foods can help ease inflammation in the body? Share with us your favorite foods from this list! Is your skincare regimen missing something?